The history of Black Elk Peak—previously known as Hinhan Kaga and, more recently, as Harney Peak—remained segmented and scattered throughout the shadows of antiquity, until now. The natural landmark's namesake, Black Elk, experienced his great vision here, solidifying his status as a Sioux holy man. Obstructed by the insurmountable granite, General Custer and his horse nearly summited during the 1874 expedition. On that granite, sculptor Gutzon Borglum made the decision to carve a grand monument into the face of nearby Mount Rushmore. Prior to serving as the first Pine Ridge Reservation Indian agent and then mayor of Rapid City, Valentine McGillycuddy documented his ascent to the peak in 1875, where his ashes would come to rest. 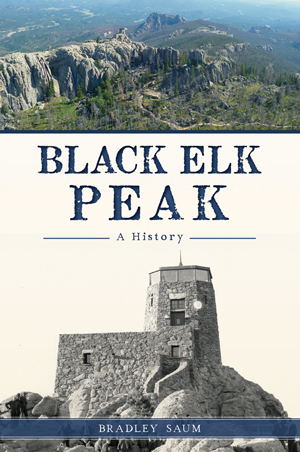 Author Bradley Saum chronicles the unique and untold stories that are intrinsically linked to the highest point in the Black Hills. A graduate of the University of Dayton, Bradley Saum has diverse work experiences ranging from wildland firefighting to federal law enforcement and senior-level management positions with Fortune 500 companies. He is a volunteer alumnus of the Student Conservation Association and served as an outdoor education instructor, as well as a park ranger with the National Park Service, South Dakota State Parks and Ohio State Parks.